In the humorous speech contest, our very own Nicki Rehn and Kate Millar competed and delivered impressive speeches. 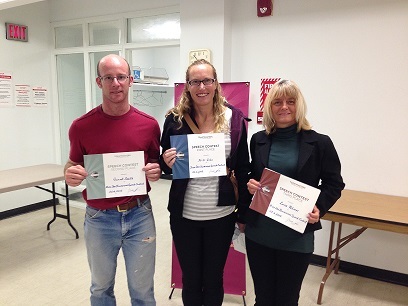 Nicki Rehn took first place and will be heading to the division J contest on October 29th! 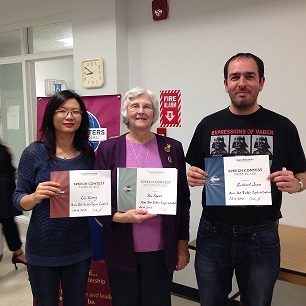 In the table topics contest, our very own Bev Swan placed second AND Lei Xiong placed third! 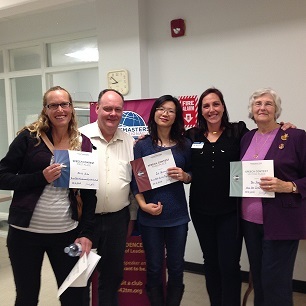 If that isn't enough to brag about, Westhills' Bev Swan won the 2014/2015 Area Toastmaster Of The Year Award AND our very own Elena Tyminski won the Area Rookie Of The Year Award! Both of these individuals will be nominated for the Division J Contest Of The Year Awards, which will be announced at the contest on October 29th. Well done to our Westhills crew and congratulations to all of our contestants who represented our club. Please come show your support and help cheer Nicki on at the Division J Contest taking place on Thursday, October 29th at 6pm at the scenic acres community centre (8825 scurfield drive NW).